prudsys AG will be presenting different applications of its prudsys Realtime Decisioning Engine (prudsys RDE for short) at the dmexco in Cologne on September 14 and 15, 2016. Trade show visitors will be able to discover more about innovative personalization scenarios and even get to test them out live in the so-called Omni-channel Hub in Hall 6 Stand F-011. dmexco 2016 opens its doors on 14 and 15 September under the motto “Digital is everything – not every thing is digital”. With over 30,000 visitors, it is one of the leading trade fairs in the world of digital marketing. For those working in retail, personalization of all sales channels is the key in order to target customers. 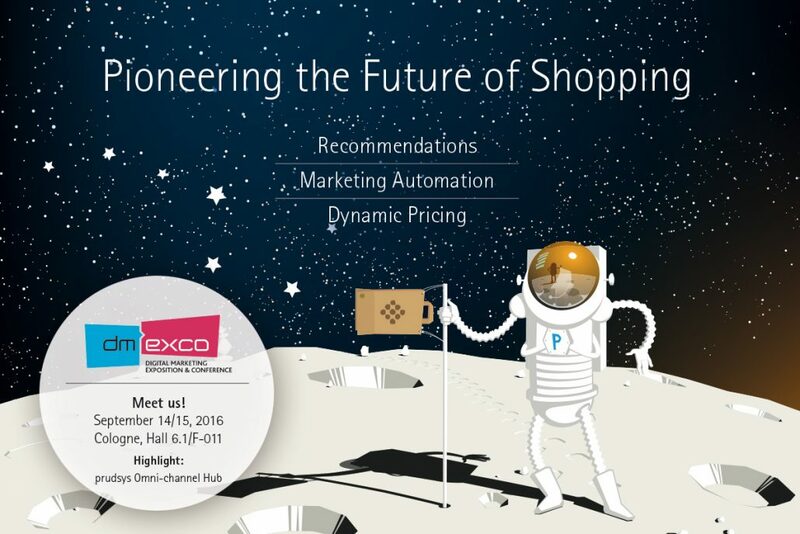 prudsys AG, specialist in real-time personalization, will be presenting a whole range of innovative personalization scenarios at the dmexco 2016 in its so-called Omni-channel Hub. Visitors to the showroom will be able to view and try out all different use cases in real-time personalization with the prudsys Realtime Decisioning Engine (prudsys RDE for short). The Hub will have a consultant tablet showing real-time recommendations for the use in branch offices, personalized print catalogs and even individual customer queries via a smart TV app. prudsys RDE is one of the most successful personalization solutions worldwide and enables retailers to offer their customers a unique cross-channel shopping experience. Intelligent, self-learning algorithms analyze the behavior of every individual user and react automatically in real time. To take just one example, personalized content and dynamic prices can be generated in the online shop, newsletter or call center. The results speak for themselves: high acceptance, a positive influence on customer satisfaction and a substantial increase in sales. prudsys will be presenting these and other innovative features in Hall 6, Stand F-011 at the dmexco in Cologne on September 14 and 15, 2016. Appointments in advance are welcome at prudsys.de/en/dmexco.